General submission data: form name (which was used to send e-mail message), page name (on which the form was located – called as referrer post), sender user agent, sender IP. Message details: sender, receiver, recipients, CC, BCC, reply to (all data in format: name and e-mail address), subject and body of the message. Form data: list of form fields and values. 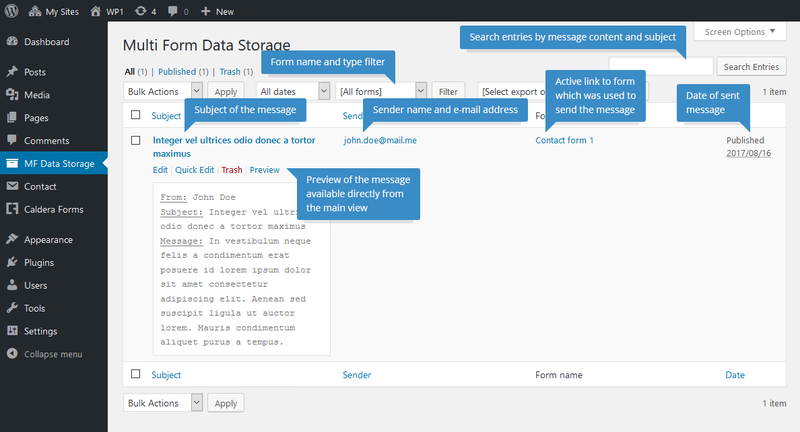 Form files: list of files attached to the message (files are stored in Media Library). 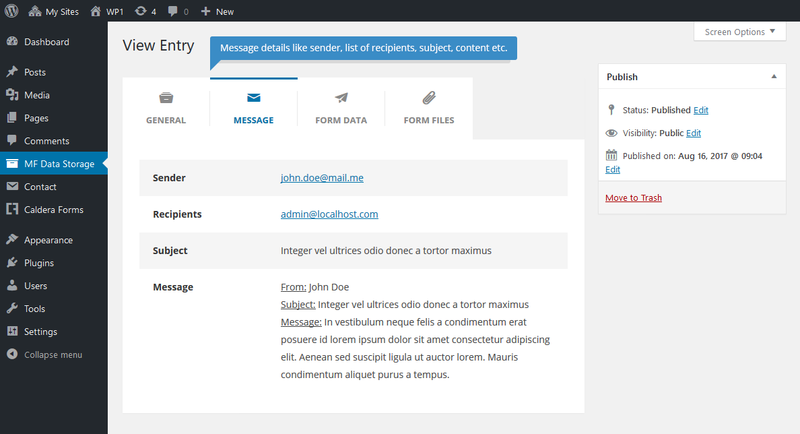 Search and filter forms submissions by contact form type, content of message body and the subject. 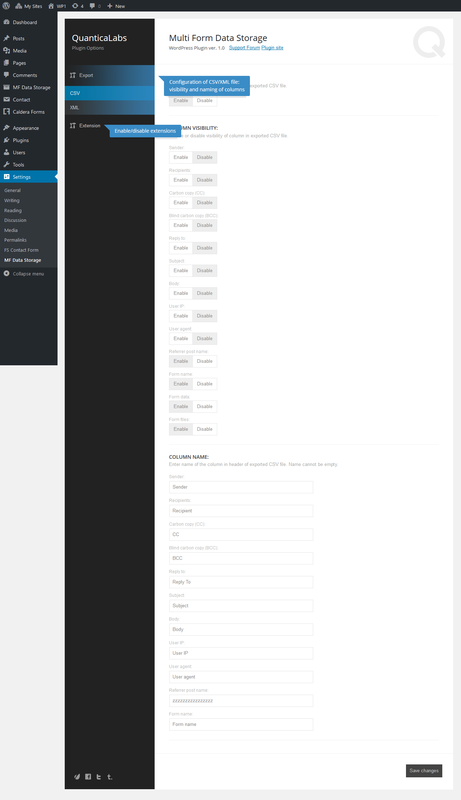 Use all the other default WordPress functionality (such as deleting entries, performing bulk actions etc.) – the plugin doesn’t limit these options. 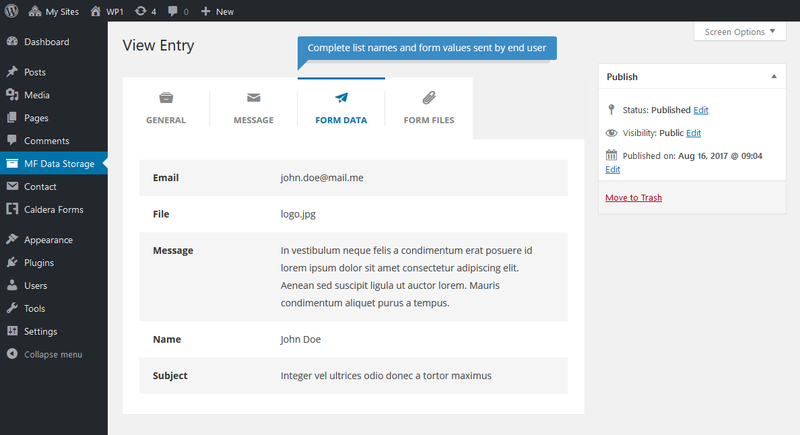 Detailed view of entry (which is available by clicking on Edit link) contains all data submitted by end user organized in four tabs: General, Message, Form data and Form files. The plugin allows you to export submitted entries to formats like: CSV (separated by tabs or semicolon) and XML. File with exported data can be created based on query results or by user selection. User is able to control (via Plugin options) names and availability of fields for both types of files. installed at least one of the supported plugins: Contact Form 7, Caldera Forms or Fast Secure Contact Form. The plugin is compatible with the newest WordPress version. The plugin is translated into languages: English, Polish. Download the plugin (select Installable WordPress file only option) from CodeCanyon to your computer. You will get the file in ZIP file format. Go to WordPress dashboard and navigate to Plugins / Add new. Upload ZIP package from the first point. Click the Activate link that appears below the plugin’s title. Unzip it to access the uncompressed files. Connect to your server using your preferred FTP application (e.g FileZilla). Navigate to the wp-content/plugins folder within the WordPress installation on your website. Upload uncompressed plugin to this location via FTP. Go to WordPress dashboard and click on Plugins menu. Now your plugin is installed and ready to work. Please note that plugin is ready to work directly after installation and activation process. No other action or setup is needed. Added new translation language: Polish.